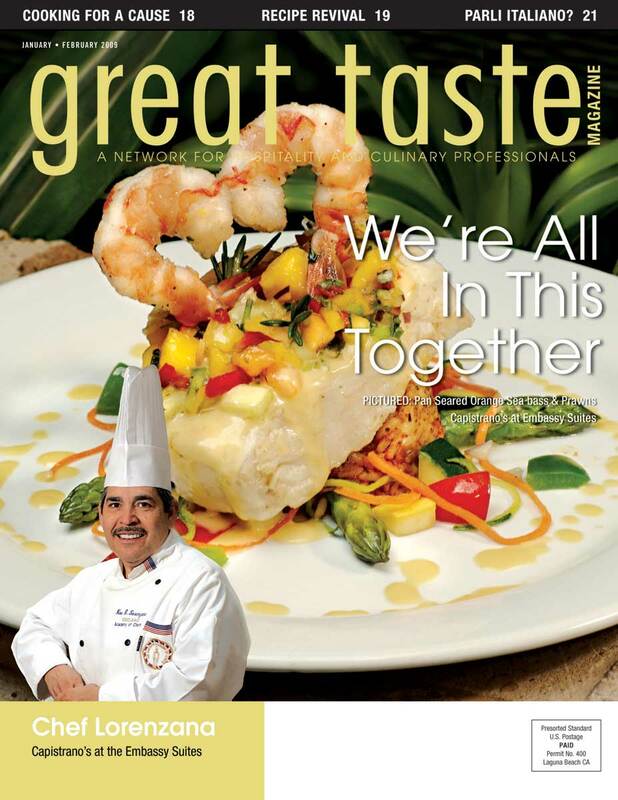 Great Taste Magazine 2009 Jan/Feb Issue features Chef Noe Lorenzana and culinary news, tips, recommendations and recipes from Orange County restaurant chefs. Azmin Ghahreman Sapphire Laguna teamed up with Miracles for Kids and other local donors to deliver holiday baskets to families in need through the Basket of Miracles program. Over 160 custom baskets were made during the holidays. Mia and Alessandro Pirozzi Cucina Alessa prepared dinner for 150 residents. The Newport Rib Company donated cash to 25 local-area schools and charities in their 25 Days of Charity event to commemorate their 25 years anniversary. These are just a few restaurateurs that gave back, many more can be read about in the magazine! The giving back does not stop there. In January, The Orange County Wine and Food Center in Costa Mesa hosted Cooking for a Cause. Cooking for a Cause was developed to offer Chefs and Restaurateurs a creative outlet where they could join together to raise funds with Culinary Action Direct, a nonprofit organization organized by Chefs to give back to Orange County. Make sure you do not miss this issue – the spirit of giving is contagious! Great Taste Magazine 2009 Jan/Feb Issue covers the restaurants and the professionals with resources, recipes, beautiful photos and many tasty tidbits. Great Taste Magazine, the premiere connection to all the key decision makers in our local Southern California restaurant industry. Each month our 15 year-old full-color trade publication reaches thousands of the area’s top restaurant owners, general managers, executive chefs and buyers. Take a tour through the magazine. Each issue features a restaurant and local chef, and is packed with the timeliest information, critical operational tips and other industry news important to our readers.